Join us on our Oman Photography Workshop for rewarding and unique photography opportunities, suitable for photographers of all levels. Magical and mystical, Oman is a beautiful corner of the Arabian Peninsula that is warm and welcoming, steeped in Bedouin and Arabic history and hospitality it is the place engage with the Arab world without the distorted lens of the opulent wealth of its neighbours. It is bursting with photographic opportunities, from the capital Muscat, to the deserts, riverbed oases, labyrinthine souk and a long coastline that is home to turtles and flamingos. This nine-day intensive workshop encapsulates the most exceptional locations that Oman has to offer, and the chance to see some camels as well! Lead by award-winning official Sony advocate photographer Andy Yee, and accompanied by Aperture Tours founder Alexander J.E. Bradley, this tour will push your photography to the next level. The intimate group size is designed for personal attention to develop your photographic vision. We begin our adventure in the port capital, Muscat. After picking you up from the airport, and sharing a welcome dinner together, we will explore the city that is scenically wedged between the ocean and the mountains. It boasts old fortifications that look down over the port and protect the massive, contemporary Sultan Qaboos Grand Mosque as well as the old waterfront Muttrah quarter, with its labyrinthine-like souk and busy fish market. Flower-rich parks fill this gentle city and when the opera house lights up at night, you can not deny its beauty. We will pass by the 17th Century Nakhal Fort for some stunning views from the battlements. Our 4WD cars will navigate the steep pass to Wadi Bani Awf. Deep in Oman's countryside are many villages still retain their traditional charm. Perhaps the most appealing of these is Bilad Sayt, a tranquil mountain hamlet tucked away in the mountains. The road, or should I say the track, is steep, but it is worth the nail-biting. We will stop off at Misfat Al Abreen, set in a stunning landscape above terraced plantations of date palms; a rare sight in Oman as most palms are grown on the plains. The ancient houses and ruined watchtower perched on the mountain complete the scene. We will sleep at the top of Jebel Shams, “Sun Mountain”, Oman’s highest peak. The cooler temperatures will surprise as you reach the top to get a spectacular view of the “Grand Canyon”. Nizwa is Oman’s cultural capital and launch pad for the region filled with castles, forts, date plantations, Waddi and some prime markets. The 17th Century Jabrin castle is one of the finest of its kind. Bahla, one of the oldest small towns of Oman dating back to the 12th century was the capital for the tribe living in the region and famous for its pottery even today. We will make a special trip to the Sinwa market, which will host its incredibly Camel market during our trip. The intense auction brings people from across the country to this amazing spectacle. The Sinaw Souq is amongst one of the oldest preserved souqs in Oman and it is a hive of activity where you can see immaculately dressed men and delicately decorated ladies selling their wears, from date, spices, silver and livestock sold frantically by auction and it is wonderful to see Bedouins bidding for a goat or a camel. No trip to Oman would be complete without a trip to the desert! We will track across the ribbed sands to rub shoulders with camels being headed by Bedouins as we sleep in an unpowered luxury desert camp where the sky will show us a display of thousands of stars. Our final days will be spent along the natural landscape and unspoiled shorelines of the Arabian coast as we animal watch. Filim has a shallow bay that is a haven for flamingos and Ras Al Jinz is world renown for the nesting of the endangered green turtle, probably the most important nesting concentration on the Indian Ocean. This is the only place where the public can watch the nesting process of these amazing sea-giants and is a once in a lifetime opportunity. We follow the coast back to Muscat passing some spectacular oasis, such as Wadi Shab one of the most beautiful wadis and its pools with clear deep blue water give you an opportunity to take a refreshing dip. We will return and sleep in Muscat at the end of Day 9. That night’s accommodation is included, the workshop will disperse after breakfast the following morning. 2018 Travel Photographer of the Year finalist Alexander J.E. Bradley is the founder of Aperture Tours. A photographer by spirit as well as by trade, he has dedicated himself to his camera and opening up the world in order to break down barriers. Alexander's style has been described as a "vivid lucid dream" as he enjoys mixing surreal elements into his conceptual work. His passion for photography grew hand in hand with his passion for travel, having visited over 60 countries worldwide to perfect his craft. 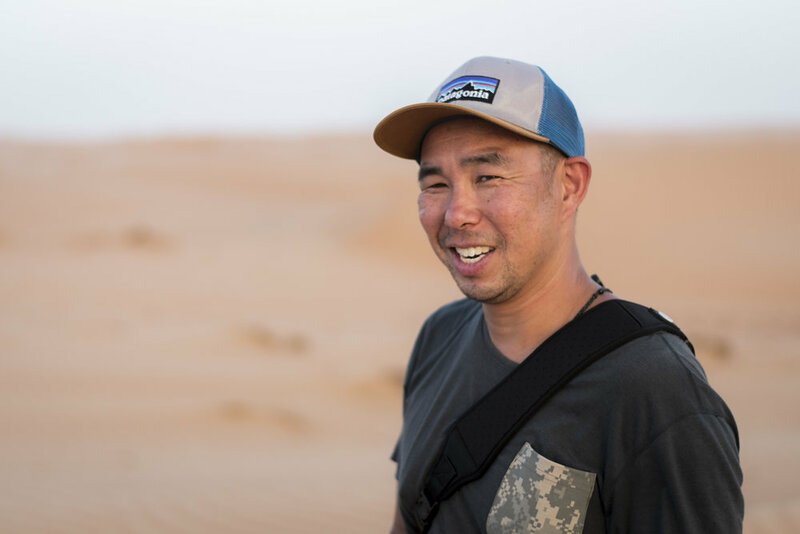 A skilled teacher, he enjoys sharing his passion and helping people unlock their photographic potential in the most beautiful destinations in the world. He is a bohemian, a photographer, a philosopher and traveler... in that order. Oman is a gastronomic destination in and of itself mixing Arab, Persian, Indian, Asian, Eastern Mediterranean, and African cuisine, reflecting Oman's position as a vast trading empire at the intersection of traditional spice trade routes. All meals, breakfast, lunch and dinners, as well as water and soft drinks, will be offered, but the alcohol is on you (where available). We will be staying in three-star or greater hotels or luxury desert tents during our trip. Each hotel has been selected for their quality and offers a comfortable stay in well-equipped rooms or elaborate desert tents. All rooms on the workshop will be provided as dual occupancy, but there are limited spaces available as a single room for a €500 supplement. We understand getting the photo into the card is only half of the battle. During the workshop, there will be time to go over post-processing to help you create images that pack a punch. Our photographers will sit down with you to assist your selection process, Lightroom and Photoshop workflows and techniques, and develop your best images, so you can showcase your photography prowess. The learning and sharing from all and the different perspectives of all participants were wonderful. Having the expertise and guidance of three professional photographers added to the value and learning experience of this workshop. The instructors are fantastic, caring and understanding individuals who always went the extra mile to ensure that everyone was comfortable and happy... Definitely customer centric individuals!! Alexander taught us so much in such a short period of time. He is smart, high energy and focused on teaching. The photos we took will be treasured for a lifetime. The teaching included camera use, taking advantage of camera features we didn't know we had, design of photos such as use of line and light to create interesting shots, use of a tripod and long exposure times at optimal camera settings to create stunning images and much more. All this knowledge was shared with grace and good humor! We highly recommend!!! The Aperture Tours Workshop was a great experience! We covered some great locations, and the leader's knowledge of the area meant we didn't waste time getting to the best locations at the optimum times. The accommodation and food were excellent, and the leader's knowledge meant we got a good 'taste' of life as well as some truly memorable memories and images.